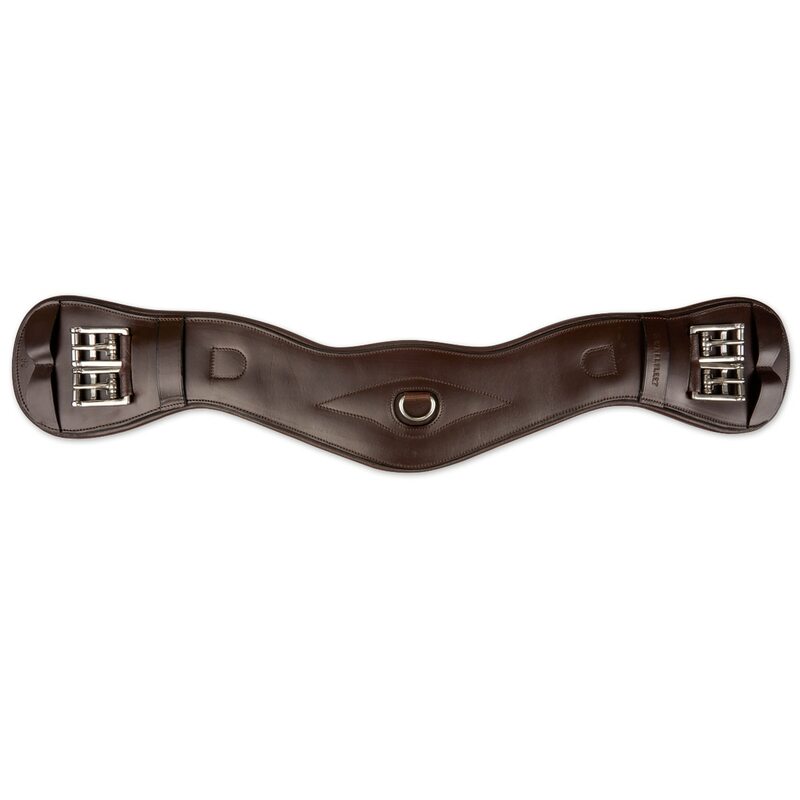 The Wellfleet® Contoured Monoflap Dressage Girth is crafted from supple, high-quality leather and thoughtfully designed with your horse’s comfort in mind to give you the luxury features that you want, without the luxury price. The ergonomic contouring of the girth gives your horse the benefit of optimal fit and freedom of movement while fitting perfectly with your monoflap dressage saddle. The cutback design allows your horse to more fully extend his stride while also providing relief for both the elbow and shoulder. The shape of the girth also allows for the billets to stay properly aligned. This can be especially helpful for horses whose high withers tend to make the billets sit at an angle, adding uncomfortable pressure. Plus, soft padding and leather ensure extra pressure relief. Additionally, it has individual girth billet keepers to keep buckles securely in place. Finally, it boasts a handy D-ring attachment that makes adding a martingale or draw reins a breeze. This girth is an ideal choice for sensitive horses as well as those with high withers, broad shoulders, or other conformational issues that can make proper girth and saddle fit a priority. Please note, this girth is designed to fit with the curve in the middle of the girth facing towards the front of the horse.